Religions | Rent-A-Friend 2000's Biblical Thinking and Good Times! His mood is pretty good, though his contacts are pretty dry . Whenever people talk about the differing religions of the world, someone will come up with the following analogy, or some variation thereof. In fact, mine is a variation thereof. So there. Of. There is a zoo where works zoo keeper Adventure Steve. He takes care of all of the animals, including an elephant named Zito. The elephant in turn takes care of his rubber duck. The rubber duck doesn’t take care of anyone. She just floats around in Zito’s water dish. One day, a bus full of philosophers came to the zoo on a field trip. They were the Society of Smarty Pants Philosophers (the S.S.P.P. ), and their field trip was also a contest (As everything is for the Society of Smarty Pants Philosophers). 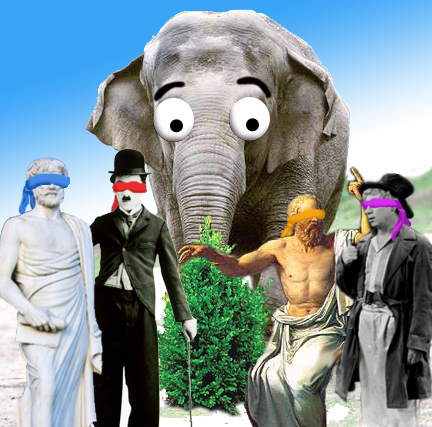 When they got off the bus, they were all blind folded and lead to the elephant to see who had the smartest pants (metaphorically speaking). Though it has nothing to do with my topic, I wish to start with an example of how marriage really can be an amazing partnership. My wife and I, working together for mutual triumph, recently achieved a 500 note streak on Guitar Hero. 500 notes! I know, right? I was so psyched! I think it is an excellent start to our seventh year of marriage, and I thank God for her. Speaking of God (For aside from being your Rent A Friend, I am the Transition King), this is part two of my explanation of the nature of God. First, I am a Christian and I know Him. He’s real. It would be profoundly stupid for me to start with some other god, none of which I believe to be real, when I am trying to map out the nature of truth. Also, with almost all other religions, their god (Or gods or godess or what have you) is not the eternal, self existent creator of all from nothing. This means you have to start a step before them with the pre-existing universe, whatever it was, and then go back to find out who or what made THAT and what proto-universe They lived in… and frankly, it gets me dizzy trying to figure out where, if ever, the process might end. So, we’re gonna Occam’s Razor all of that and assume that we only need one God and one universe. Otherwise we’ll need a padded cell and a lifetime supply of Aspirin. There is much that can, has, and will be said about God/Jesus, but for right now my purpose is to prepare you for the Metaphysical journey, and it starts with God. 1. God is ETERNAL. He exists outside of time (Which he created) but can act inside of time. He had no beginning and will never end. The god of Mormonism, for instance, lacks this divine aspect. Its idea of “God” is that any man can become god of their own world by being Super-Mormon. Thus, our god was once a man, born on another planet under another god, and he earned his way up to his present status as the man-with-the-biggest-desk. The god he once lived under was once himself a man who earned his way up the corporate ladder under a still different god, and so on. Despite the built in stairway-to-heaven structure, it is still considered rude to refer to Mormonism as a “Pyramid Scheme,” so don’t do that. Of course the Greeks, Romans, and Egyptians had a fun bunch of comic book hero gods and goddesses, almost all of which came into being by being born, or built, purchased on e-bay, or in one case, popping out of Zeus’s head like some giant zit. Of the 330 millions gods of Hinduism (No, seriously, 330 million! Imagine the endless potential for holidays!) only one is actually eternal- The Brahman. The rest are forms or facets of that one which emerged from him at some point. Also, some would argue that the Brahman is more of an impersonal force than a god per say, but that’s another semantic blog for another semantic day. Despite the name, the Brahman is NOT a comic book super hero. If you can figure out what the superpowers of The Brah-Man would be, let me know. Maybe we can start a new comic book. Bollywood would be itching to make the movie! Or would condemn us as blasphemous heretics! I’m really not sure which! 2. God is ALL POWERFUL. He can do anything that can be done. This obviously wasn’t the case for most of the old school gods. They were always getting tricked, fooled, manipulated, or coerced. Sometimes they would get stuck under a rock, or injured or killed in personal vendettas and gangland warfare, like our modern Gangsta Rappers. I’m guessing the reason all those old religions died out was the invention of baseball and daytime television. Let’s be honest, between Soaps and Sports, you have everything the “Zeus & Co. Players” could come up with. A good example of how the Biblical God is different than other gods is just the fact that most of your popular religions have a particular god or goddess for everything. Thor can do thunder, lightning and maybe even light showers coming from the northwest, with strong gusts up to 35 miles per hour, but can he do ferrying the to the underworld? No. For that you need Anubis or Charon. And they can’t do a thing for crops. You need some corn god for that one, like Osiris. And can the corn god do apple trees too? Probably not. The Union would never allow that kind of thing even if he had the time. This is probably how the Hindus got 330 million gods in the first place. Jesus can do 330 million things by himself, so one God is plenty. 3. He is the CREATOR of all space, time, matter, energy, etc. He created it out of nothing. There is NO creation account like the one in the Bible except, oddly, the Big Bang Theory. God made EVERYTHING from NOTHING some finite time ago. All other creation stories have some pre-existing world with water and plants and a sky and probably a Radio Shack and a tanning salon. The Big Bang Theory agrees that the universe popped into existence from nothing, nowhere, and nowhen a finite time ago, but it rejects the idea of a creator and says the universe is un-caused; it sort of made itself, like a rabbit pulling itself out of a hat without a hat. Or a rabbit. This would be an amazing magic trick (without a magician) and well worth the price of admission. No one would argue that it is not infinitely unlikely to happen, but, as it has been said “it only had to happen once.” Some of you think I’m making this up, but sadly I am not. I’ll explain it all some other time. 4. God is ALL KNOWING. He knows all that is, was, or will be, and all that would be were things different. And because he is out of time, he doesn’t need to remember stuff or predict it, he sees it all in an eternal NOW. Again, all of your other religions have stories where various gods trick each other or where humans fool their gods or pull one over on them. It wasn’t so much a religion as a cartoon with some of these guys. I don’t mean to be disrespectful, but when your god has the same problems running the world that Elmer Fudd does bagging a rabbit, you seriously need to rethink whether he’s worthy of worship. 5. God is PERSONAL. Unlike The FORCE (TM Lucasfilms Ltd) He has thoughts, feelings, preferences, characteristics, and a will. While Jedi Master Qui-Gon Jinn did imply once that the Force ™ also has a will, he may have been speaking metaphorically and certainly does not represent the Jedi Temple, The Council, nor the majority of Jedi doctrine. 6. God’s main motivation/Character trait is LOVE. While he is righteous and just, he loves us with a really BIG love and therefore made a way for sin to be punished (satisfying his righteous justice) and yet adopt us into his family. Nutshell in a nutshell: God is Big, Unique, and wonderful- and He Loves You! OK, there is your foundation for the metaphysical map to everything. Whew! Covers a LOT of ground. Now that I have this done, I need to go play some more Guitar Hero. Maybe you should go do the same. I can’t say there is a direct correlation between my excellent marriage and my good Guitar Hero score, but it is worth trying. HAPPY NEW YEAR/DECADE!!!! New Decade update for my readers: Just before Christmas, I scored a 300 note streak on Guitar Hero on medium. Yup, you can bet THAT went on my resume almost immediately. Who rocks? THIS guy! For Christmas my beautiful wife got me an old-school View Master and 3 disks of Hawaii so I can take a tropical vacation whenever I want. I just put on the sound machine set to “ocean” and I am THERE. I got her the complete set of New Kids on the Block trading cards from the 1980’s and a Cabbage Patch lunch box. I am the king of romance. To start the new year, I have decided that, as your Rent A Friend, it is my obligation to walk you through the often murky waters of Philosophy and Metaphysics. The best way to walk through anything, as I learned at the zoo a few days ago, is with a map. Otherwise you wind up standing at the Tiger cage saying, “Where is that Polar Bear?” and looking like a real tool. So I am going to draw you a metaphysical map of everything. The very start of the metaphysical journey is God. Everyone has an opinion about God. There’s the atheist who says “I know beyond a shadow of a doubt that there is no God!” yet when asked for proof, they tend to argue that they don’t need to prove it. They just KNOW. It’s we silly Theists that need to prove that he’s there in the first place. Then when you give them Intelligent Design sciences, historical/legal proofs, logical philosophy and manuscript evidence for the Bible that outweighs all of antiquity combined, they tell you it’s all just propaganda. There’s no pleasing some people. Then there are the agnostics. The thing that confuses me most about this group is the apathy. There is no religion anywhere that says, “God is real, but it really doesn’t matter. If he wants you to believe in him, he’ll stop by your house and give you a toaster oven or tote bag for signing up, so don’t worry about it too much.” In my mind, every agnostic should be SCRAMBLING for data, evidence, and comparison charts. They admit that God MIGHT be real. Which means heaven and hell MIGHT be real. Which means they MIGHT be able to, in some fashion, attain salvation and heaven eternal, OR they might be damning themselves and simply be too lazy to find out for sure. This is the way I am about my personal health, but for me, there is a certain somewhere in the future, weather I’m in good shape now or not. There are no ETERAL ramifications for my apathy. The stakes, I could argue, are a touch higher for the agnostics. In America we have the very popular Oprah Winfrey philosophy of religion which says, “There CAN’T be only one way.” In short, everyone wins. No matter what you think, you’re right. I’d like to see Oprah sit down with a Muslim and an Atheist and explain it to them; “Look, for you there is an Allah watching you, judging you on your merit according to the Koran and the teachings of the Prophet Mohammad. You’ll face judgment day and the reward of your good and evil throughout your life. For you, on the other hand, I guess Allah will stay out of your way and after you die he’ll just turn out the lights and stay real quiet until you stop paying attention. Nobody’s wrong here.” I just don’t see an agreement on the panel that day. When it comes to the question of WHY all religions can’t be true, Oprah actually serves as my best argument. She started this weird internet cult with a guy names Ekhart Tole, where they were trying to make a religion that said “ALL religions are the same, so buy my book.” During the cult-class, she asked him what happens when you die, and he said he did not know. This of course was the best time to draw a blank, because no matter what answer he picked, someone would be right and someone would be wrong. The atheist says oblivion. We cease to exist. Jews, Christians, and Muslims say heaven or hell. Mormons say only heaven, but different layers of heaven (Like a big birthday cake), unless you were REALLY good, in which case you get to be a god and run your own planet. This, to me, explains the popularity of Mormonism. Shinto say you wander the earth as a shadowy ghost figure, occasionally stopping by your family’s kids to see how they’re doing and if they left you some tea or a snack. And in the Robin Williams/Cuba Gooding Jr. film What Dreams May Come, you get heaven, unless you choose hell, and God still fails to show up wherever you go, and if you get bored with heaven, you can reincarnate and take another shot at it just for kicks. In short, there is NO WAY everyone can be right. You can’t go to eternal heaven, oblivion, and reincarnate all at the same time. Oh, you can TRY, but you’ll fail. And I think we all know that even if you did succeed, it would ruin your credit rating and your insurance wouldn’t cover ANY of it. I myself am a Christian, and so I will be defining God according to His personal self-revelation as recorded in the Bible. Eventually I will explain why this makes the most sense in all ways Theological, Logical, Metaphysical, Historical, Scientific, and Personal, but first I need to draw a Metaphysical map so you don’t get lost. The very start of the metaphysical journey is God. Now, if it were possible to sum up God in a single paragraph, the Bible wouldn’t need to be so long, so this will be an overview. Feel free to ask questions. Most of these ideas are easy to find in Genesis, Psalms, the end of Job, the four gospels (Matthew, Mark, Luke, and John), and especially in the book of Romans where Paul gets deep with it all. 1. God is ETERNAL. He exists outside of time (Which he created) but can act inside of time. As Jesus Christ he existed inside of time like a normal man, but he was arguably smarter and more talented than the rest of us. 2. God is ALL POWERFUL. He can do anything that can be done (Which means, no, he can’t make a square circle, so don’t ask. It’s a silly question anyway). 3. He is the creator of all space, time, matter, energy, etc. He created it out of nothing. Modern science calls this The Big Bang, only when asked where all the matter, energy, time and space came from, they just shrug their shoulders and hope that “nowhere” is an acceptable answer. 4. God is ALL KNOWING. He knows all that is, was, or will be, and all that would be were things different. And because he is out of time, he doesn’t need to remember stuff or predict it, he sees it in an eternal NOW. 5. God is PERSONAL. Unlike the FORCE (TM Lucasfilms Ltd) he has thoughts, feelings, preferences, characteristics, and a will (Though Qui-Gon Jinn did imply once that the Force ™ also has a will, he may have been speaking metaphorically and certainly does not represent the majority of Jedi doctrine). 6. God made us to have a personal RELATIONSHIP with him. We exist for a purpose- to know and love God and to be known and loved by him. 8. Jesus (God incarnate) lived a perfect life and then was crucified and died as the payment for our sins. He was the final and perfect sacrifice that paid for all of our sins, giving us the ability to be made right with God. 9. Salvation is through Jesus, and all you have to do is accept it. Then, God will adopt you into his family and he will be your heavenly father forever. 10. God’s main motivation/Character trait is LOVE. While he is righteous and just, he loves us and therefore made a way for sin to be punished (satisfying his righteous justice) and yet save us to be adopted into his family. 11. I’ll explain the Trinity some other time. There is no way to make short work of that I promise you. Let’s sum it up with “God is more complicated than most.” It’s one of the reasons he is so fascinating. OK, next time I’ll explain how this view of God is different in every way than the gods of other religions/Oprah. In the mean time, I’m gonna go try Guitar Hero on Hard and see how long I last. Happy New Year from your Rent A Friend!